My personal laptop continues to infuriate me with its stubbornness and hateful refusal to work properly so here I am at the public library trying to formulate all of my cumulative thoughts that I’ve been stewing into an organized and creative post. So, I might ramble on relentlessly as all of my tightly contained thoughts burst through a suddenly open seal. All is not lost though: this is one of my few opportunities to be sans children and finally get to focus 100% of my attention on my own selfish needs. I didn’t complain too much about having to step away to visit the library by myself. I’m afraid to say this will likely be another whiney post amongst my other repetitive posts. But, even five months after my last whiney post, we haven’t seen much progress in Drew’s recovery. So, let’s review since I have been silent for so long: Drew’s major corrective surgery process which included installing the fixators followed by the slow correction and then removal was completed June 2013. 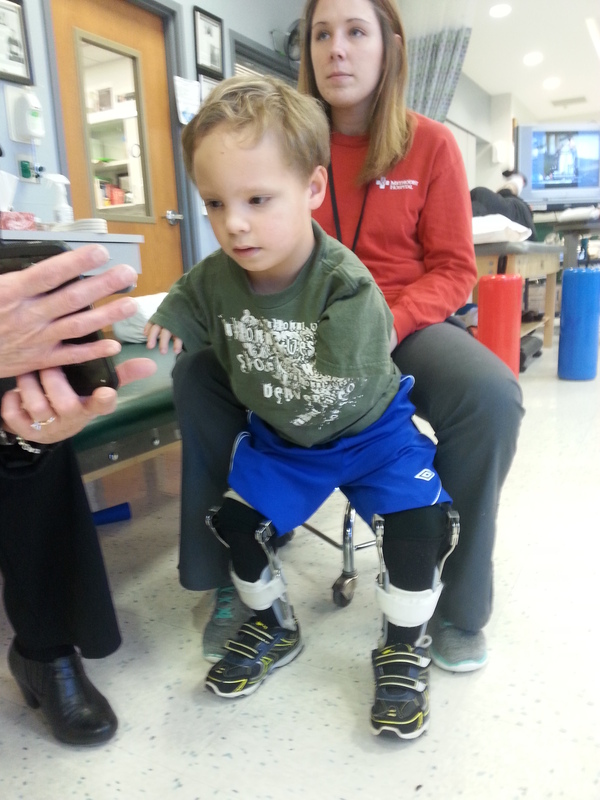 In September 2013, Drew took his first steps and by early 2014 Drew was a full-time walker, only occasionally using a wheelchair. Then, in July 2014 Drew had to undergo an unexpected surgery on both legs to correct a fracture and perform some additional straightening. Drew’s progress stalled there. Since his surgery in July, Drew hasn’t walked. At all. He’s just now attempting to stand and even then it’s strained, hunched over and he collapses from exhaustion after 30 seconds or so. Weight-bearing is painful for his knees and seeing as he’s unable to straighten each leg much beyond a 90 degree angle, when he does stand it’s like he’s mid power-squat so you can imagine how exhausting it must be to stall mid power-squat and hold for any lengthy period of time. It’s been 2.5 years of constant therapy. Even now, 2.5 years later, we’re doing 5-7 days of therapy a week, three days at the hospital and 3-4 days of therapy at home due to insurance requirements. And, we’ve gotten nowhere. Yes, Drew did miraculously walk early this year and it was glorious. But, I think about all those people who beat the odds…they were told they would never walk only to prove the doctors wrong…I mean, honestly, how many times can one person defy the odds…overcome such a life-altering challenge? I feel like Drew already achieved that miracle and miracles, by definition, are rare aren’t they? What are the chances of him doing it twice? There is only so much one person can achieve, much less a 6-year old. I don’t mean to sound like I’m doubting Drew’s strength and resolve, but there is a point at which every person – I don’t care how determined a person is – reaches a ceiling of maximum performance. Maybe this is Drew’s new best. He has weak knees due to the anatomy of his knee, he’s undergone numerous extremely invasive surgical corrections to his legs which completely altered his naturally-created skeleton….I mean, I feel like I can’t adequately describe to you the magnitude of what’s been done to Drew surgically. His entire skeleton was CHANGED. It was cut, and twisted, and yanked, and pulled…more than I thought even one body could tolerate. How can one just have their body completely rearranged and then just go on like nothing ever happened?!? Maybe they can’t! Maybe we’ve done all this for nothing! If that is the case, then he is worse off than what he was before the surgeries. Before the surgeries, we thought it was the worst thing to not be able to walk, to be confined to a wheelchair. But now, he can’t walk, confined to a wheelchair and in a lot of pain! And he has to exhaust himself at therapy every day. For what?!? *exhausted sigh* Therapy was hard before…immediately after all of the initial correction. I had my moments of despair and fear. But Drew pushed through it all and he walked. But, it feels different this time. Maybe because we are just utterly exhausted….the fight is always stronger in the beginning when you’re motivated and pumped then gradually grows weaker as you become tired and beaten. But, it seems so much harder this time. And, not only does it seem harder this time, I feel like I have less fight in me. I’m so over having to wrestle Drew into wearing his braces, having to have the same motivational speech for the BILLIONTH time. We are all just miserable! I’m sure in some way he resents us for the pain and labor we’ve forced upon him and we resent the process for ruining these years for us as a family! We’ve had to deny him so many things because how the surgeries, pain, therapy or just plain “let’s wait until you’re stronger” would interfere. Constant cross-country travel, financial expenses, physical therapy, pain, braces, inconvenience….this hasn’t been fun at all. I love Drew with all of my heart, but it makes me sad to think that I just can’t wait until these years are over and in the past! I should be longing for him to never grow up and having fun, laughing, giggling…but instead, I just can’t wait until this over. Of course, I don’t mean that I want him to be gone, I mean, I just want to go back to the fun part. May 2012 at four years old till current, almost seven years old is marred by all of this trauma and I will NOT be looking back at this with nostalgia. I hate this!! And, I feel like we’re all alone because nobody else I know closely has gone through this. I’ve spoken to other Paley patient’s families, but it doesn’t seem to take them as long from start to finish. Not to diminish their own journey, but one leg was lengthened and after many months of therapy they are walking. And, that’s great…I’m so happy for them! But, it’s hard having to recall two legs, one year of fixators, a fractured femur, a foot turned the wrong way, unexpected surgeries, throw in an open heart surgery and a tonsillectomy/adenoidectomy and TWO AND A HALF years of therapy to be no closer to the goal than prior to process beginning! Well, I’ve been in this library for over an hour now and I still have yet to reserve our hotel room or rental car for our upcoming trip to see Dr. Paley so I better get on it. I reckon the baby is awake from his nap. And, I could use cuddles from baby, Drew and daddy right now. The only thing that will get me out of this funk at the moment. Next Post Finally Good News!